Russian Bride Guide. Russian Cities, Khabarovsk. Khabarovsk is the centre of Khabarovsky krai. The area of Khabarovsk is 38,6 thousand hectares (01.01.2001). The population is 604,2 thousand people. The city has 5 administrative districts. Khabarovsk, one of the oldest cities of the Amur region, was founded and built according to the most ancient town-planning rules: on a high bank, for military men, craftsmen and tradesmen. Before the revolution of 1917 city life and development were determined by its status of the provincial capital. The fastest growth of the city fell on the Soviet period. From middle 20s up to middle 80s the city had grown ten times more. There appeared a number of the large industrial enterprises and scientific and research institutes. Today Khabarovsk is the largest industrial, transport, cultural and scientific centre of the Far East. The city comprises about 100 enterprises of machine-building, metal working, building, food, light and other industies. The largest enterprises of the city are the plants "Daldiesel', 'Khabarovsk oil refinery", "Amurkabel", " Khabarovsk plant of the heating equipment", 'Khabsudmash". 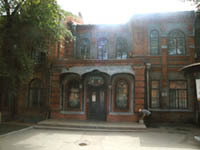 Leading enterprises of the food-processing industry are "Khabarovsky fat factory', "Khabarovsk distillery", "Amur - Pivo", "Baltimore - Amur", "Sputnik' Confectionery factory" and others. Khabarovsk is the largest railway junction of the Far East. There are 4 railway stations, 3 depots and a large switchyard Khabarovsk II in the city. The Amur river shipping company carries out passenger and tourist voyages from Khabarovsk down Amur to Nikolayevsk-on-Amur and down the river Sungari - over the Chinese territory. The cargo port accepts and serves sea crafts. The city airports provide cargo and passenger transportation by local airlines over the country and abroad. In Khabarovsk function 93 daytime comprehensive schools for 46759 pupils and 109 preschool establishments. Here one can see 28 hospitals, 66 polyclinics. There are 5 theatres, 16 houses of culture and clubs, 28 libraries, 5 museums, 4 parks, 3 cinemas, 10 stadiums, 19 swimming pools in Khabarovsk. In 2000 the city received the official status of the capital of the Far East.